The next step is to establish a baseline for normal Amazon RDS performance in your environment, by measuring performance at various times and under different load conditions. As you monitor Amazon RDS, you should consider storing historical monitoring data. This stored data will give you a baseline to compare against with current performance data, identify normal performance patterns and performance anomalies, and devise methods to address issues. For example, with Amazon RDS, you can monitor network throughput, I/O for read, write, and/or metadata operations, client connections, and burst credit balances for your DB instances. When performance falls outside your established baseline, you might need to change the instance class of your DB instance or the number of DB instances and Read Replicas that are available for clients in order to optimize your database availability for your workload. High CPU or RAM consumption – High values for CPU or RAM consumption might be appropriate, provided that they are in keeping with your goals for your application (like throughput or concurrency) and are expected. Disk space consumption – Investigate disk space consumption if space used is consistently at or above 85 percent of the total disk space. See if it is possible to delete data from the instance or archive data to a different system to free up space. Network traffic – For network traffic, talk with your system administrator to understand what expected throughput is for your domain network and Internet connection. Investigate network traffic if throughput is consistently lower than expected. Database connections – Consider constraining database connections if you see high numbers of user connections in conjunction with decreases in instance performance and response time. The best number of user connections for your DB instance will vary based on your instance class and the complexity of the operations being performed. You can determine the number of database connections by associating your DB instance with a parameter group where the User Connections parameter is set to a value other than 0 (unlimited). You can either use an existing parameter group or create a new one. For more information, see Working with DB Parameter Groups. IOPS metrics – The expected values for IOPS metrics depend on disk specification and server configuration, so use your baseline to know what is typical. Investigate if values are consistently different than your baseline. For best IOPS performance, make sure your typical working set will fit into memory to minimize read and write operations. AWS provides various tools that you can use to monitor Amazon RDS. You can configure some of these tools to do the monitoring for you, while some of the tools require manual intervention. We recommend that you automate monitoring tasks as much as possible. Amazon RDS Events – Subscribe to Amazon RDS events to be notified when changes occur with a DB instance, DB snapshot, DB parameter group, or DB security group. For more information, see Using Amazon RDS Event Notification. Database log files – View, download, or watch database log files using the Amazon RDS console or Amazon RDS API actions. You can also query some database log files that are loaded into database tables. For more information, see Amazon RDS Database Log Files. Amazon RDS Enhanced Monitoring — Look at metrics in real time for the operating system. For more information, see Enhanced Monitoring. Amazon CloudWatch Metrics – Amazon RDS automatically sends metrics to CloudWatch every minute for each active database. You are not charged additionally for Amazon RDS metrics in CloudWatch. For more information, see Viewing DB Instance Metrics. Another important part of monitoring Amazon RDS involves manually monitoring those items that the CloudWatch alarms don't cover. The Amazon RDS, CloudWatch, AWS Trusted Advisor and other AWS console dashboards provide an at-a-glance view of the state of your AWS environment. We recommend that you also check the log files on your DB instance. For more information on these checks, see Trusted Advisor Best Practices (Checks). You can monitor DB instances using Amazon CloudWatch, which collects and processes raw data from Amazon RDS into readable, near real-time metrics. These statistics are recorded for a period of two weeks, so that you can access historical information and gain a better perspective on how your web application or service is performing. By default, Amazon RDS metric data is automatically sent to CloudWatch in 1-minute periods. For more information about CloudWatch, see What Are Amazon CloudWatch, Amazon CloudWatch Events, and Amazon CloudWatch Logs? in the Amazon CloudWatch User Guide. When you use Amazon RDS resources, Amazon RDS sends metrics and dimensions to Amazon CloudWatch every minute. You can use the following procedures to view the metrics for Amazon RDS. If necessary, change the AWS Region. From the navigation bar, choose the AWS Region where your AWS resources reside. For more information, see Regions and Endpoints. In the navigation pane, choose Metrics. Choose the RDS metric namespace. Choose a metric dimension, for example By Database Class. To sort the metrics, use the column heading. To graph a metric, select the check box next to the metric. To filter by resource, choose the resource ID, and then choose Add to search. To filter by metric, choose the metric name, and then choose Add to search. The AWS/RDS namespace includes the following metrics. The percent of General Purpose SSD (gp2) burst-bucket I/O credits available. [T2 instances] The number of CPU credits spent by the instance for CPU utilization. One CPU credit equals one vCPU running at 100% utilization for one minute or an equivalent combination of vCPUs, utilization, and time (for example, one vCPU running at 50% utilization for two minutes or two vCPUs running at 25% utilization for two minutes). [T2 instances] The number of earned CPU credits that an instance has accrued since it was launched or started. For T2 Standard, the CPUCreditBalance also includes the number of launch credits that have been accrued. Credits are accrued in the credit balance after they are earned, and removed from the credit balance when they are spent. The credit balance has a maximum limit, determined by the instance size. Once the limit is reached, any new credits that are earned are discarded. For T2 Standard, launch credits do not count towards the limit. When an instance is running, credits in the CPUCreditBalance do not expire. When the instance stops, the CPUCreditBalance does not persist, and all accrued credits are lost. The number of failed SQL Server Agent jobs during the last minute. The maximum transaction ID that has been used. Applies to PostgreSQL. The lagging size of the replica lagging the most in terms of WAL data received. Applies to PostgreSQL. The average number of disk read I/O operations per second. The disk space used by replication slot files. Applies to PostgreSQL. The amount of swap space used on the DB instance. This metric is not available for SQL Server. The size of transaction logs generated per second. Applies to PostgreSQL. The average number of disk write I/O operations per second. This dimension filters the data you request for a specific database instance. This dimension filters the data you request for a specific Amazon Aurora DB cluster. This dimension filters the data you request for a specific Aurora DB cluster, aggregating the metric by instance role (WRITER/READER). For example, you can aggregate metrics for all READER instances that belong to a cluster. This dimension filters the data you request for the identified engine name only. For example, you can aggregate metrics for all instances that have the engine name mysql. This dimension filters the data you request for the specified region only. For example, you can aggregate metrics for all instances in the region us-east-1. You can create a CloudWatch alarm that sends an Amazon SNS message when the alarm changes state. An alarm watches a single metric over a time period you specify, and performs one or more actions based on the value of the metric relative to a given threshold over a number of time periods. The action is a notification sent to an Amazon SNS topic or Auto Scaling policy. Alarms invoke actions for sustained state changes only. CloudWatch alarms will not invoke actions simply because they are in a particular state, the state must have changed and been maintained for a specified number of periods. The following procedures show how to create alarms for Amazon RDS. Choose Alarms and then choose Create Alarm. This launches the Create Alarm Wizard. Choose RDS Metrics and scroll through the Amazon RDS metrics to locate the metric you want to place an alarm on. To display just the Amazon RDS metrics in this dialog box, search for the identifier of your resource. Choose the metric to create an alarm on and then choose Next. Enter Name, Description, and Whenever values for the metric. If you want CloudWatch to send you an email when the alarm state is reached, for Whenever this alarm:, choose State is ALARM. For Send notification to:, choose an existing SNS topic. If you choose Create topic, you can set the name and email addresses for a new email subscription list. This list is saved and appears in the field for future alarms. At this point, the Alarm Preview area gives you a chance to preview the alarm you’re about to create. Choose Create Alarm. Call put-metric-alarm. For more information, see AWS CLI Command Reference. 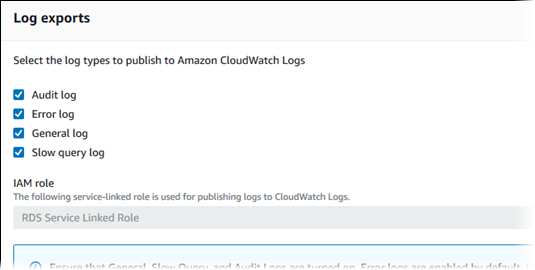 You can configure your Amazon RDS database engine to publish log data to a log group in Amazon CloudWatch Logs. With CloudWatch Logs, you can perform real-time analysis of the log data, and use CloudWatch to create alarms and view metrics. You can use CloudWatch Logs to store your log records in highly durable storage, which you can manage with the CloudWatch Logs Agent. For example, you can determine when to rotate log records from a host to the log service, so you can access the raw logs when you need to. You can export logs for Amazon RDS MariaDB (all versions) and Amazon RDS MySQL (versions 5.6, 5.7, and 8.0). You must have a Service Linked Role before you enable log data publishing. For more information about Service Linked Roles, see the following: Using Service-Linked Roles for Amazon RDS. To publish your database log files to CloudWatch Logs, choose which logs to publish. Make this choice in the Advanced Settings section when you create a new DB instance. You can also modify an existing DB instance to begin publishing. After you have enabled publishing, Amazon RDS continuously streams all of the DB instance log records to a log group. For example, you have a log group /aws/rds/instance/log type for each type of log that you publish. This log group is in the same AWS Region as the database instance that generates the log. After you have published log records, you can use CloudWatch Logs to search and filter the records. For more information about searching and filtering logs, see Searching and Filtering Log Data. Amazon RDS provides metrics so that you can monitor the health of your DB instances. You can monitor both DB instance metrics and operating system (OS) metrics. 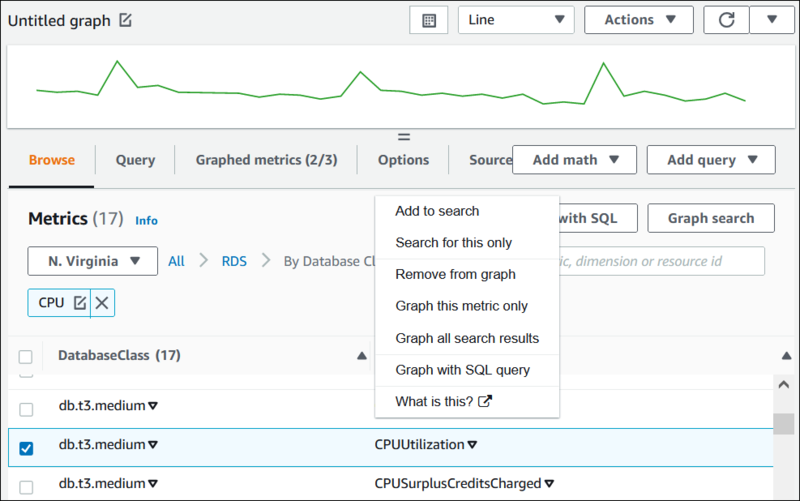 This section provides details on how you can view metrics for your DB instance using the RDS console and CloudWatch. For information on monitoring metrics for the operating system of your DB instance in real time using CloudWatch Logs, see Enhanced Monitoring. Choose the name of the DB instance you need information about to show its details. CloudWatch – Shows a summary of DB instance metrics available from Amazon CloudWatch. Each metric includes a graph showing the metric monitored over a specific time span. 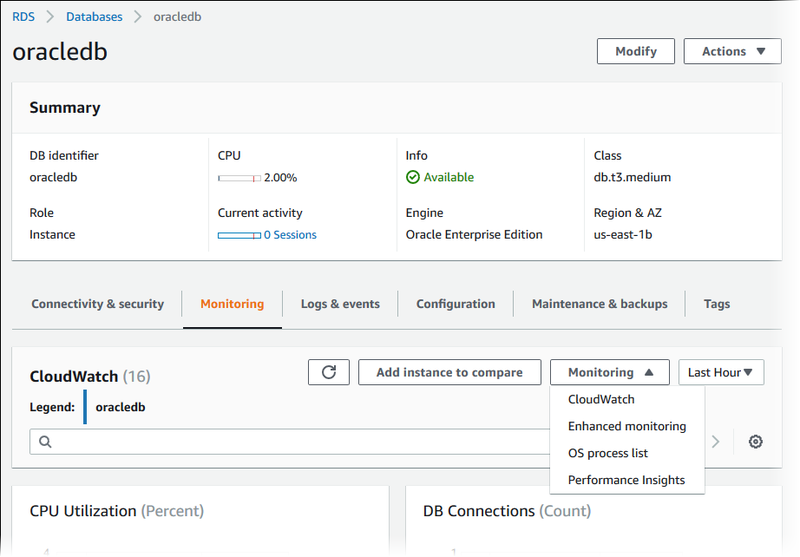 Enhanced monitoring – Shows a summary of OS metrics available for a DB instance with Enhanced Monitoring enabled. Each metric includes a graph showing the metric monitored over a specific time span. OS Process list – Shows details for each process running in the selected instance. You can choose the time range of the metrics represented by the graphs with the time range list. You can choose any graph to bring up a more detailed view. You can also apply metric-specific filters to the data. Amazon RDS integrates with CloudWatch metrics to provide a variety of DB instance metrics. You can view CloudWatch metrics using the RDS console, AWS CLI, or API. For a complete list of Amazon RDS metrics, go to Amazon RDS Dimensions and Metrics in the Amazon CloudWatch User Guide. The following CLI example requires the CloudWatch command line tools. For more information on CloudWatch and to download the developer tools, see the Amazon CloudWatch product page. The StartTime and EndTime values supplied in this example are for illustrative purposes. You must substitute appropriate start and end time values for your DB instance. Use the CloudWatch command mon-get-stats with the following parameters. The StartTime and EndTime values supplied in this example are for illustrative purposes. You must substitute appropriate start and end time values for your DB instance.